International Women’s Day, celebrated on March 8th this year, calls attention to the fact that women often face barriers regarding social, economic, cultural and political achievements. When it comes to farmed animals, female animals are some of the most abused. 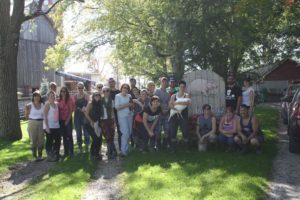 Whether it’s cows who are repeatedly impregnated only to have their offspring taken from them at birth, to sows who spend their lives confined to gestation crates, to egg hens who spend months and often years in small, cramped wire cages, the plight of female animals is not for the faint of heart. 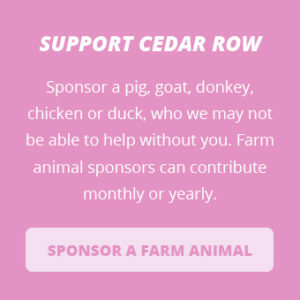 So we celebrate the female animals that call Cedar Row home and who are free from the abuse and neglect that often befalls other female animals in the animal agriculture industry. Siobhan with a rescued ex-battery egg hen (September 2015). Chickpea, a dairy cow who was rescued and lives at Cedar Row. Bardot, who fell off a slaughterhouse truck, lives in peace at Cedar Row. Dorothy & Sadie, two sisters who came to Cedar Row at just a few days old, are now grown and enjoying a life of freedom with their other goat, pig and cow friends.